Whether you prefer a wood, vinyl or concrete bulkhead construction project for the enhancement of your Monmouth or Ocean County NJ waterfront home, we will deliver a great looking quality bulkhead built to last decades. And High and Dry House Raising has the capability to build bulkheads measuring any height and length. And projects may include standalone or in conjunction with a House Raising. The building of a bulkhead can be a very valuable investment addition to your residential or commercial waterfront property. 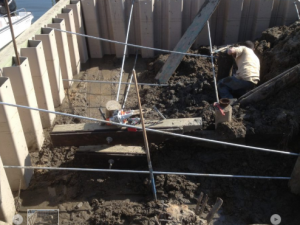 Whether it’s to reduce land erosion or enhance your property, High and Dry House Raising has the capability for designing, replacing and/or installing a bulkhead that will last! What is more, a bulkhead project will increase the home’s value.